Added support to TSMBIOS for SMBIOS 2.8 spec. A few weeks ago (3 Apr 2013) a new update to the System Management BIOS (SMBIOS) Reference Specification was introduced by the DMTF. So the TSMBIOS project was updated to support the SMBIOS 2.8. Categories: Delphi, FreePascal, SMBios | Tags: Delphi, FPC, SMBIOS | Permalink. 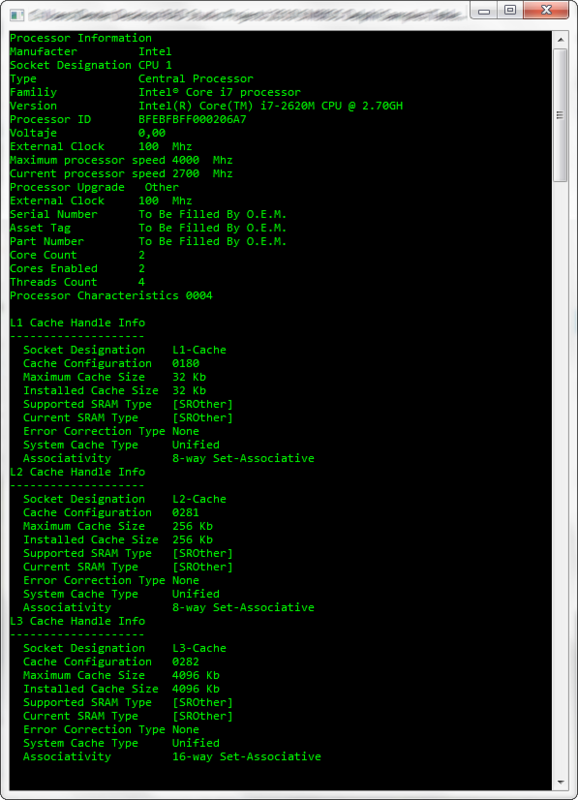 The SMBIOS expose the info about the installed processors in the table type 4. Check the next snippet that shows how obtain such data using the TSMBIOS (remember, if you are using FPC, you can use this library in Windows and Linux). Great news for the Free Pascal developers, I just added Linux support to the TSMBIOS project. Note : The TSMBIOS read the SMBIOS info using the /dev/mem device file which provides access to system physical memory, so the code must be executed using a user with the proper permissions. Categories: Delphi, FreePascal, SMBios, Tools | Tags: Delphi, FPC, SMBIOS | Permalink. A few weeks ago I started a new project called TSMBIOS, this is a library which allows access the SMBIOS using the Object Pascal language (Delphi or Free Pascal). SMBIOS stands for System Management BIOS , this standard is tightly related and developed by the DMTF (Desktop Management Task Force). The SMBIOS contains a description of the system’s hardware components, the information stored in the SMBIOS typically includes system manufacturer, model name, serial numbers, BIOS version, asset tag, processors, ports, device memory installed and so on. 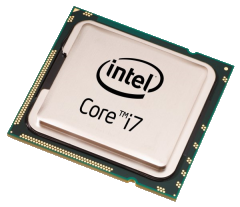 Note : The amount and accuracy of the SMBIOS information depends on the computer manufacturer. Which are the advantages of use the SMBIOS? You can retrieve the information without having to probe for the actual hardware. this is a good point in terms of speed and safeness. The SMBIOS information is very well documented. You can avoid the use of undocumented functions to get hardware info (for example the RAM type and manufacturer). Useful for create a Hardware ID (machine fingerprint). The BIOS typically populates the SMBIOS structures at system boot time, and is not in control when the OS is running. Therefore, dynamically changing data is rarely represented in SMBIOS tables. The SMBIOS Entry Point is located somewhere between the addresses 0xF0000 and 0xFFFFF, in early Windows systems (Win95, Win98) it was possible access this space address directly, but after with the introduction of the NT Systems and the new security changes the BIOS was accessible through section \Device\PhysicalMemory, but this last method was disabled as well in Windows Server 2003 Service Pack 1, and replaced with 2 new WinApi functions the EnumSystemFirmwareTables and GetSystemFirmwareTable, Additionally the WMI supports reading the entire contents of SMBIOS data i using the MSSMBios_RawSMBiosTables class inside of the root\wmi namespace. Note : you can find more information about the SMBIOS Support in Windows on this link. If you uses the WinApi Mode you don’t need use COM and the final size of the Application will be smaller, but the WinAPI functions was introduced in Windows Vista and Windows XP x64 (So in Windows Xp x86 will fail). Otherwise using the WMI mode you will need use COM (CoInitialize and CoUninitialize), but also you will get two additional advantages 1) The WMI will work even in Windows Xp x86 systems, 2) You can read then SMBIOS data of local and remote computers. // Use this constructor to load the SMBIOS data from a previously saved file. // Use this constructor to read the SMBIOS from a remote machine. 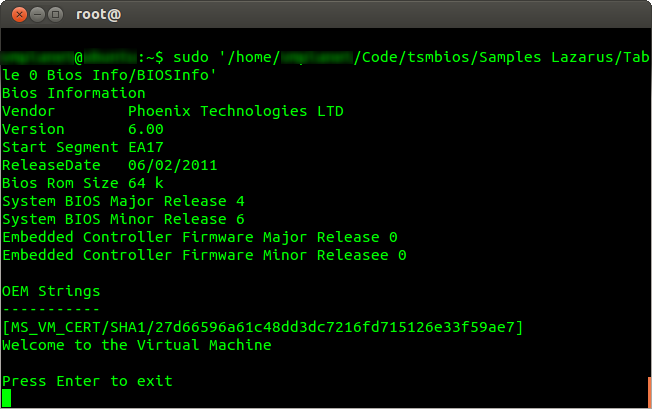 and finally use the property which expose the SMBIOS info which you need. In this case as is show in the sample code the BatteryInformation property is used to get all the info of the batteries installed on the system. Source Full documented compatible with the help insight feature, available since Delphi 2005. Supports Delphi 5, 6, 7, 2005, BDS/Turbo 2006 and RAD Studio 2007, 2009, 2010, XE, XE2, XE3, XE4. The TSMBIOS is a Open Source project is hosted in the Github. Update : The WMI Delphi Code Creator now is hosted on Github. The Delphi code generated is compatible with Delphi 7, 2005, BDS/Turbo 2006 and RAD Studio 2007, 2009, 2010, XE. You can access directly from the application the MSDN web page related to the WMI Class which your are using. Compile and run the generated code directly form the application using the selected compiler. Open the the generated Free Pascal code directly in the Lazarus IDE. 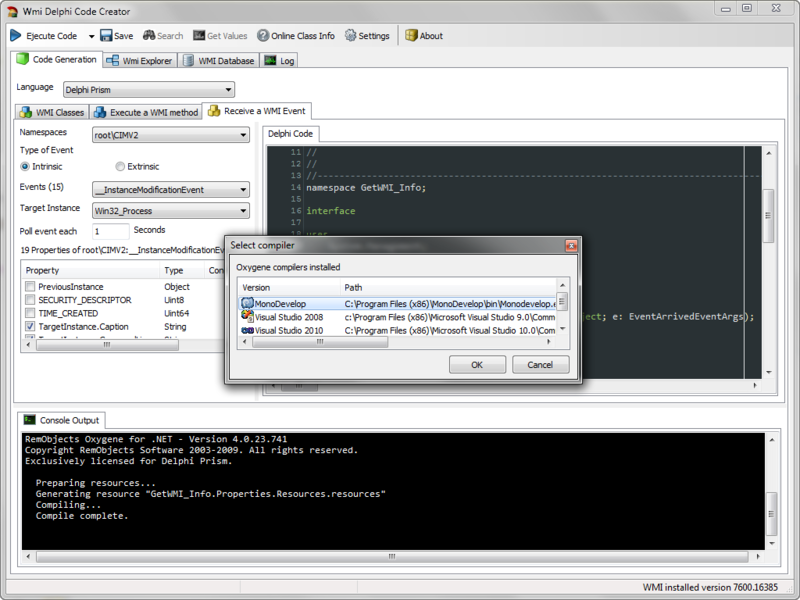 Open the the generated Delphi Prism code directly in Visual Studio 2008, Visual Studio 2010 or MonoDevelop. Runs on Windows XP, 2003, 2008, Vista and 7. Themes support for Syntax highlighting (+50 themes included) compatible with the Delphi IDE Theme Editor. Categories: Applications, Delphi, Delphi Prism, FreePascal, Lazarus, WMI | Tags: Applications, Delphi, Delphi Prism, FreePascal, Lazarus, WMI | Permalink. A fellow Delphi programmer, ask me how they can access the WMI using the COM API for WMI , so I decide write this article to show how. First you must to know which this API was designed primarily for low level access to the WMI from C++ and for create WMI providers, compile mof files and so on. In the past articles always I show samples to use the WMI using late binding or importing the Microsoft WMIScripting Library. in both cases you are using the same layer to access the WMI (WMIScripting). In the next diagram you can see the layers to access the WMI, you can note how the WMIScripting finally access the WMI using the WMI COM API. In the next sample you will learn how avoid this additional layer. The interfaces of the COM API for WMI are very similar to the Microsoft WMIScripting Library because the last is just a wrapper for the COM object. Now In order to set the general COM security level you must perform a call to the CoInitializeSecurity function. Create a connection to a WMI namespace. Set the security levels on the WMI connection. 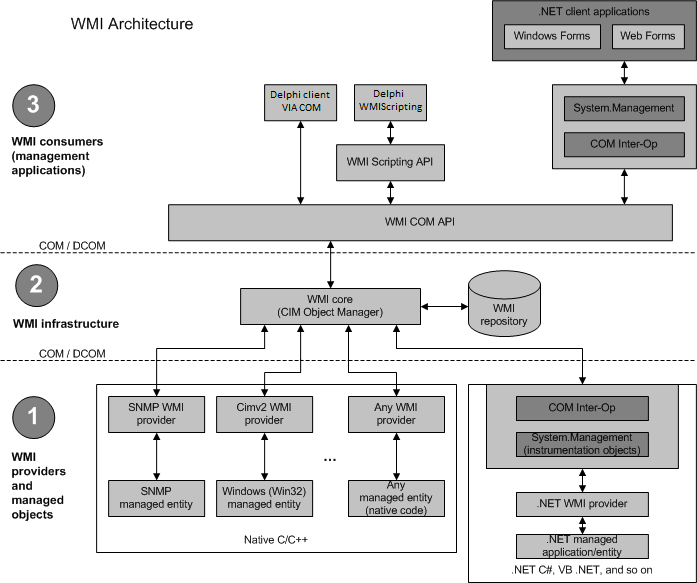 By definition, WMI runs in a different process than your application. Therefore, you must create a connection between your application and WMI and you must set the impersonation and authentication levels for your application. this must be done using the CoSetProxyBlanket and CoCreateInstance functions. Finally Cleanup and shut down your application. After you complete your queries to WMI, you should destroy all COM pointers to shut down your application correctly. this is made setting the interface to nil to calling the varclear function. Now a basic sample to make WMI query using the COM interface. And what about the Wmi events? Ok here i leave the code to manage an async event using the COM WMI API. Create a new class which descends from the TInterfacedObject class and the IWbemObjectSink interface, you must implement the Indicate and SetStatus functions. Create a instance to the class TWmiEventSink which will handle the received events and use the IUnsecuredApartment.CreateObjectStub function to create a object forwarder sink. Call the ExecNotificationQueryAsync function passing the sink instance to begin listening the events. Finally use the CancelAsyncCall function to stop the Event receiver. Check the source code of this article on Github. Categories: COM, Delphi, FreePascal, JEDI API, Lazarus, WMI | Tags: COM, Delphi, FreePascal, JEDI API, Lazarus, WMI | Permalink. Do you want test a short Pascal snippet and you don’t have a compiler? try the site called ideone. to compile and run code online in more than 40 programming languages. for the limitations about the code submitted and others check the FAQ. Categories: Delphi, FreePascal | Tags: Delphi, FreePascal | Permalink.